Limoncello (Italian pronunciation: [limonˈtʃɛlːo]) is an Italian lemon liqueur mainly produced in Southern Italy, especially in the region around the Gulf of Naples, the Sorrentine Peninsula and the coast of Amalfi, and islands of Procida, Ischia, and Capri. It is also produced in Abruzzo, Basilicata, Apulia, Sicily, Sardinia, Menton in France, and the Maltese island of Gozo. In northern Italy, the liqueur is often referred to instead as limoncino. 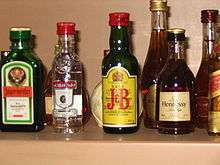 It is also a popular homemade liqueur, with various recipes available online and in print. Although there is debate about the exact origin of the drink, it is at least one hundred years old. Traditionally, limoncello is made from the zest of Femminello St. Teresa lemons, also known as Sorrento or Sfusato lemons. Lemon zest, or peels without the pith, is steeped in rectified spirit until the oil is released. The resulting yellow liquid is then mixed with simple syrup. Varying the sugar-to-water ratio and the temperature affects the clarity, viscosity, and flavor. Opaque limoncellos are the result of spontaneous emulsification (otherwise known as the ouzo effect) of the sugar syrup and extracted lemon oils. The United States has seen a rise in commercial producers using California lemons which are grown year round, with 90% of the United States lemon crops coming from California. A popular ingredient in cocktails, limoncello imparts a strong lemon flavor without the sourness or bitterness of pure lemon juice. 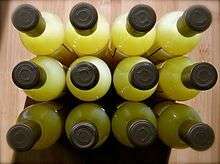 An ethanol content of 38–42% is considered optimal for limoncello, though as with many liqueurs, alcohol content can vary widely especially among homemade variants. ↑ "Homemade Limoncello". Imbibe. Retrieved 10 April 2012. ↑ Kristin Tillotson (July 3, 2008). "Limoncello Citrus Liqueur Recipe Is Far From Lemonade". The Minneapolis Star Tribune. Retrieved 10 April 2012. 1 2 Charles Perry (September 8, 2004). "Taste of a thousand lemons". The Los Angeles Times. Retrieved 10 April 2012. 1 2 Jayne Cain (2011). "When Life Gives Italians Lemons, They Make Limoncello". Rick Steves' Europe. Retrieved 10 April 2012. ↑ Valerie Waterhouse (September 2010). "5 Ways to See Italy". Travel + Leisure. Retrieved 10 April 2012. ↑ Andrea, V.; Nadia, N.; Teresa, R. M.; Andrea, A. (August 2003). "Analysis of Some Italian Lemon Liquors (Limoncello)". J. Agric. Food Chem. 51 (17): 4978–4983. doi:10.1021/jf030083d. PMID 12903956.